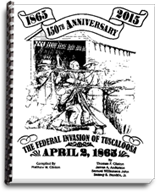 The "General Robert E. Rodes" Camp presents a special sesquicentennial re-publication of The Federal Invasion of Tuscaloosa compiled by Matthew W. Clinton, written by Thomas P. Clinton, James A. Anderson, Beasey S. Hendrix, Jr., and Samuel Williamson John. Only limited quantities will be available. Books will be $10/ea. + $3.50 S/H. The "General Robert E. Rodes" Camp meets at 7 PM on the third Thursday of each month at the Rotary Room of the Tuscaloosa Public Library. Meetings provide educational programs and a variety of guest speakers. Visitors are always welcome - members will assist prospective members interested in establishing their Confederate ancestry. Membership is open to all male descendants of any veteran who served honorably in the Confederate armed forces. Membership can be obtained through either lineal or collateral family lines and kinship to a veteran must be documented genealogically. "A People without Pride in their Heritage, is a Nation without Purpose." 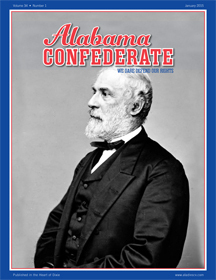 Promote Your Heritage, and the Alabama Division! 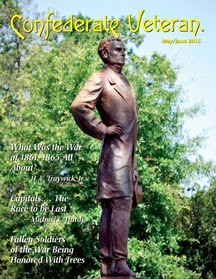 Buy the Alabama SCV Car Tag!